Back to school today – back to our normal routines. Waking up with the alarm clock after a week plus break was no fun, that is for sure! While I know the girls are going to miss their free time and their “Ammi-time” they are excited to see their friends and ready to get back to the routine, I’m sure. Can you believe there are only SIX WEEKS left to the school year? Hard to imagine. After this past week with the kids at home (and me on vacation) I am not ready to start finding creative ways to entertain them while I work this summer!! They are bigger, so they are more self-directed, but I’m sure there will be days when they’re b-o-r-e-d and I’ll have to be prepared with some good activities to entertain them. So, I’m asking for your help… what are some ways you entertain your kids when they’re bored and need some diversion? 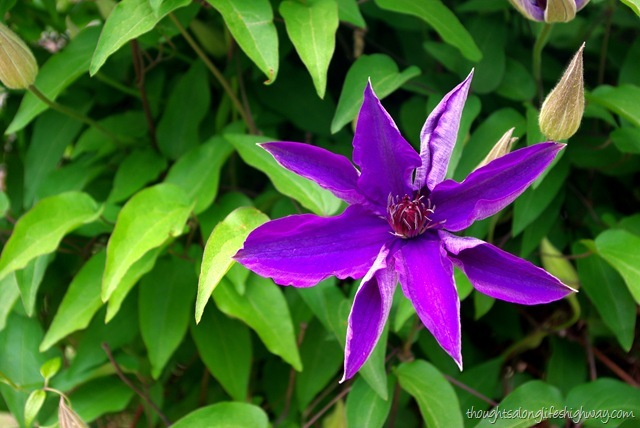 My clematis are blooming! Aren't they beautiful!?!? I have to admit that I am not looking forward to summer. Well, maybe the first couple of weeks, but after that I know I will be having to hear how bored they are. I do create a calendar with a pocket for each day. If they get all their chores done, we can do what is in the pocket. They like the suspense, and I like that their chores get done. I usually put things in the pocket like go out for ice cream, simple science experiments we can do at home, go to the park, play in the sprinkler, make root beer floats, etc. Just a variety of things that keep them entertained. Just thought I would share. What a great idea! I may have to try that one!